One of the very first things I do when we plan a trip to Disneyland is to decide how many of our favorite places to eat at I can cram into a 3 day visit. Make no mistake, we try hard to get them all every time, but which ever one we miss, we get the next time. Make sure not to miss some of these places on your next trip. 10. Harbour Gallery – Disneyland – This quick service restaurant is known for its amazing lobster rolls, and for good reason. They are so good. They also serve baked potatoes and a very tasty roast beef salad. Don’t miss this small stand or you could miss some of the best Disney has to offer. 9. Pacific Wharf Café – California Adventure – The very best thing about eating in San Francisco while visiting Disneyland. The soups and breakfast bowls are served in big Boudin sourdough bread bowls and are more than enough to satisfy any appetite. This quick service restaurant is settled on the pier overlooking Paradise Pier, so the view isn’t bad either. 8. Blue Bayou / Café Orleans – I put these two together for a few reasons. First, they are located right next to each other. Blue Bayou is a very nice table service restaurant inside the Pirates of the Caribbean ride while Café Orleans is a table service place with a more casual vibe. The menu is similar in their Creole offerings and well worth the wait, but if bowls of gumbo and crispy Monte Cristo sandwiches interest you, make a reservation. 7. PCH Grill Disney’s Paradise Pier Hotel – This place does have a very good character breakfast, but we put it on our list because of their delicious dinner menu. You can’t go wrong with the kids when they get to make their own pizza. The adults in your party will love the classic surf and turf or the seafood mac and cheese. What we loved the best was the dessert! Too many to pick from so save room for a little bit of them all. 6. Cozy Cone Motel – California Adventure – This quick service stop is a must. Each “cone” has different offerings that change between breakfast and lunch/dinner. If you are in a hurry and need a quick breakfast, make sure to get their Chorizo breakfast cone. It is an egg, chorizo and salsa scramble served in a soft, cone shaped bread bowl. At lunch time they offer churro bites with chocolate dipping sauce and a Queso cone with chili, corn chips and cheese all mixed and served in a bread cone too. 5. Wine Country Trattoria – California Adventure – This table service is a great place to stop and enjoy the views of Cars Land at night while eating some great Italian dishes. Their wine list is very impressive as well. There is something for everyone here including cheddar risotto bites and shrimp scampi. They have a good kids menu as well including create your own pasta. 4. Carnation Café – Disneyland – We found this table service restaurant on our last visit to Disneyland and it moved up pretty fast on our list of faves. The menu has a great selection from meatloaf to patty melts. Try to reserve a table around parade time and have a great meal while watching a great parade without the sitting on the concrete for hours. **3. Big Thunder Ranch BBQ – Disneyland – This all-you-can eat BBQ place is a fun family experience. Everything is served family style and the more you eat, the more ribs, chicken and sausage they bring. If you don’t fill up on the meat, stay for dessert. They have a family sized cookie served warm with 3 scoops of ice cream that is sure to put your hunger pains away for a while. 2. Goofy’s Kitchen – Disneyland Hotel – This character meal for either breakfast or dinner is always a hit with our bunch. Both meals are buffets and are definitely worth the price. They make some of the best French toast and Goofy’s very own peanut butter and jelly pizza for breakfast. The dinner menu has a little bit of everything including a delicious seafood pasta and more dessert choices than you could sample. Plus you get a visit from at least 4-5 different characters too. That always makes everything better. 1. 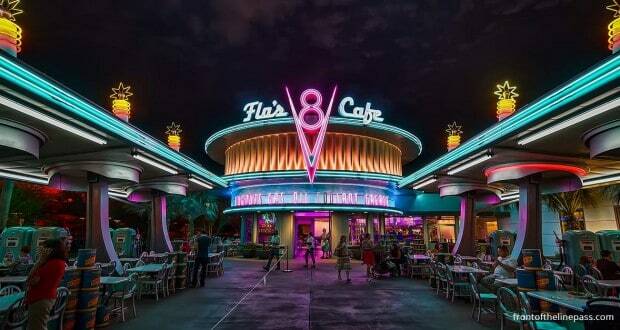 Flo’s V8 Café – California Adventure – I can’t stress enough how much you can’t afford to miss this place. This quick service restaurant has a menu that has such good items on it, you will struggle with picking just one. The roast beef and cheddar sandwich and turkey dip are 2 of our favorites. They have a good variety of thick shakes as well as some very tasty pies for dessert. So there you have it, some of our favorites on a tasty tour of Disneyland. I am sure some of these will make it on your favorite list too. Just make sure to save some for me.